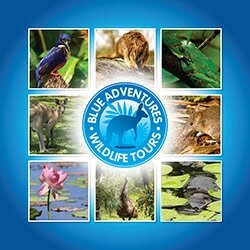 Blue Adventures is a Port Douglas based tour operator specialising in wildlife and nature tours. The team behind Blue Adventures are the same people that own and operate Blue Dive, the top Trip Advisor rated scuba diving operator in Port Douglas. We have spent many years exploring tropical north Queensland and have a passion for the environment and wildlife. On countless trips throughout the area we have discovered a range of destinations highlighting the very best our region has to offer and that allow our guests to view wildlife, explore lush rainforest, cruise pristine wetlands and more. The vision behind Blue Adventures was to create something unique and distinctive to the many rainforest tour options available from Port Douglas. Rather than just visit the rainforest we aim to get you up-close and personal with native Australian wildlife and immersed in the diverse landscape of tropical north Queensland. Contact us to find out more about our tours or visit the our Wildlife Tours or Outback & Rainforest Tours page for more information. With over 10 years spent exploring and guiding in the region, Dave is one of the driving forces behind Blue Adventures. He has a real fascination with nature and the great outdoors, and has worked as a dive instructor on the Great Barrier Reef, a Daintree Rainforest guide and a mountain bike guide in the forests around Port Douglas. If he's not working, Dave can usually be found exploring the rivers and rainforests of region with camera in-hand. Mark is the owner and operator of Blue Dive Port Douglas, and the brains behind Blue Adventures. His love of photography and showing off the beautiful region he calls home was one of the key reasons behind starting Blue Adventures, and he can talk for hours about both! Originally from London, Mark now calls Port Douglas home and is passionate about the environment and indigienous history of the area. With a degree in environmental science from Plymouth University in the UK and a passion for wildlife, Kat is an excellent guide and is great at answering your tricky questions. Hailing from the UK, Kat originally came top Australia for scuba diving and quickly fell in love with our unique wildlife and diverse environments. A skilled dive instructor, Kat now splits her time between working as an instructor for Blue Dive and wildlife guide for Blue Adventures.